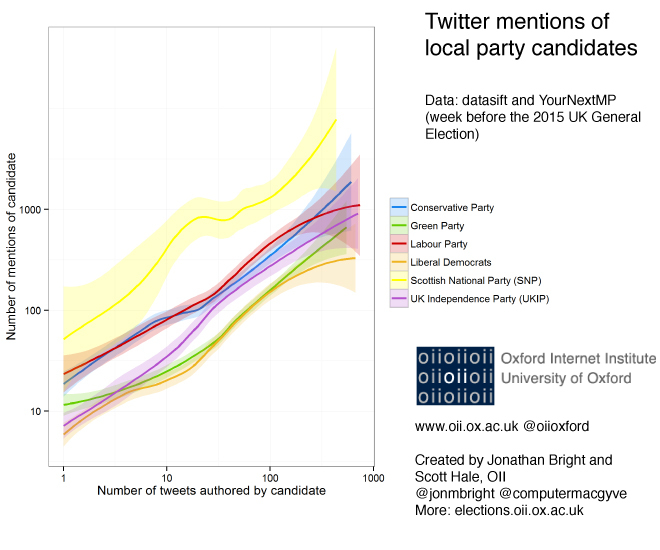 Which parties are having the most impact on Twitter? | Can social data be used to predict elections? The previous two posts have shown that the amount of effort parties are putting in on Twitter at the local level is pretty variable. But what about the response they are getting? In this post we’ll look at the amount of mentions candidates receive on Twitter. A mention could be a retweet or it could be a message @ someone – any time the candidate’s name is in there. 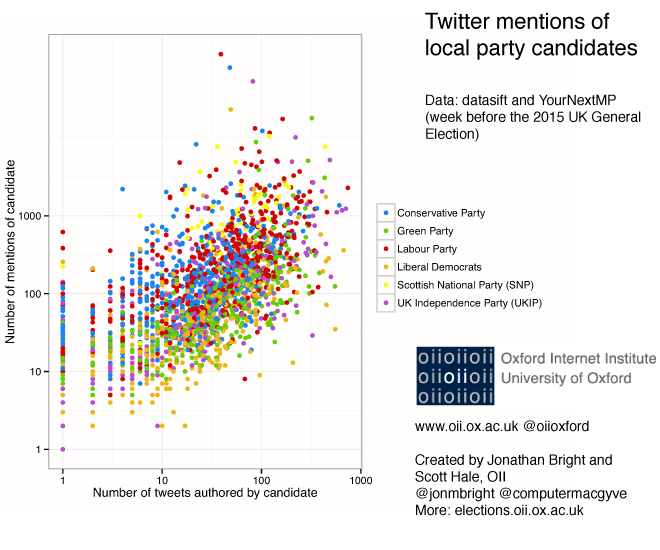 Data was harvested from Datasift, using the same YourNextMP data for the list of candidate Twitter handles. In the week before the election candidates were mentioned over one million times. Lots of that activity, it goes without saying, goes to the party leaders: Ed Miliband accounts for almost 120,000 of those mentions alone, with, Cameron, Farage, Clegg and Bennett in places 2 – 5. Yet there was also a lot of activity for less nationally famous figures: over the 2,312 candidates in the YourNextMP dataset, only 12 weren’t mentioned even once during that week (and none of them tweeted either). Why do some candidates get more attention than others? The most obvious explanation is that some candidates tweet more than others: and being active on social media ought to be a way of getting noticed. The image below plots all of the candidates in the dataset as a point, comparing the number of times they tweeted with the number of times they are mentioned, on a logarithmic scale. The positive relationship is clear. However within all the points, there also seem to be some differences between the parties. The figure below makes the different clearer by grouping all the candidates into a per party average. What it shows is that, while for every party writing more tweets tends to get more mentions, some parties have a much better “Tweet to mention” ratio than others. In other words, their tweets have on average more impact, and their presence is on average greater. Like the previous one, this graph is on a log scale, meaning that the differences between parties are in orders of magnitude. So, for example, 100 tweets from a Lib Dem candidate would give around 100 mentions; but the same amount from an SNP candidate would give over 1,000 mentions. Broadly speaking, we can see the parties form three groups on social media in terms of outreach: the SNP are clearly in front, Labour and Conservatives are in the middle, and the Greens and Liberal Democrats at the back. UKIP are somewhere in between the middle and back groups. Interestingly, these relationships hold more or less regardless of the amount of tweets sent by the candidate (and the most famous candidates were by no means the most avid tweeters – Miliband for example only authored 20 tweets in this period, whilst others authored several hundred). Summary? Some parties have a lot more impact on social media than others. NB: Post was updated slightly @ 19.45 to correct a data collection issue – overall conclusions weren’t change. This entry was posted in Data, GE2015, Twitter and tagged campaigns, ge2015, oii, oiige15, twitter on May 12, 2015 by jonathanbright.